Join us July 28, 2018 at 8:30am! The Peaks to Portland Swim to Benefit Kids is one of the oldest open water swims in the world; since before World War II thousands have braved Maine’s waters to swim the 2.4 miles from Peaks Island to Portland’s East End Beach. Participants of various fitness levels and competitive experiences ages 16 years and up are invited to race. We encourage anyone who can swim a mile in less than 40 minutes to join us for this unforgettable swim across beautiful Casco Bay! All proceeds benefit children in the YMCA of Southern Maine's youth development programs. View photos from last year’s swim here! Fundraising as a swimmer allows us to help kids like 9-year old Dizier, who lived in the family shelter in Portland with her mom and little brother. Thanks to the Y, Dizier was able to escape the stress of the shelter for a summer by attending our Otter Pond Outdoor Adventure Camp for free. At camp, she got to be a carefree kid. She made friends, sang camp songs, and was exposed to new experiences like archery and fishing. 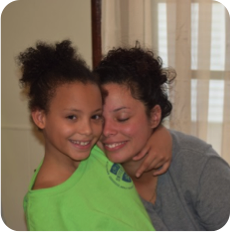 Dizier’s mother Carmen is thankful for that summer, and says Dizier’s been much more confident and happy since attending. Best of all, with Dizier in camp, Carmen was able to get back on her feet and the family is now in their own home and doing well. Are you a veteran Peaks to Portland Swimmer? Let us know! If you've completed the last five (or more!) Peaks to Portland Swims, you will be guaranteed entry each year. To qualify, please email Bob Dunfey, Race Director, with your finish times for at least the past five consecutive years ASAP in order to guarantee your entry.